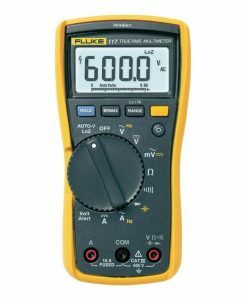 A high-end Fluke multimeter with tons of functions. The multimeter is the most important diagnostic tool you have at your disposal when attempting to fix electrical issues. For this reason, we recommend that everyone getting into miniquads have one as part of their tool kit. 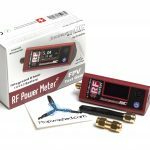 In this article, we will go over the basic functions of the multimeter and how they can be used when building or working on your quadcopter. Before we get started, it might be useful to review the fundamentals of electrical component. In particular, understanding what voltage, current and resistance is and how they relate with regards to Ohms law can really help you understand what you are doing with your multimeter. It isn’t required reading, but we recommend it. This excellent tutorial from Sparkfun which uses the water analogy for describing electricity is one of our favorites. When looking into buying a multimeter, there are a few things you should consider. Accuracy. Professional multimeters are capable of astonishing measurement accuracy down to the milli-Volts, Ohms, Amps and Farads. If you are in a professional setting, milli-Ohms might matter. For miniquads they do not. Higher ratings. As you go up in price, you will generally get the ability to measure more Amps, more Ohms – more everything really. Ruggedness. Read the reviews on Fluke multimeters and you will hear stories of people dropping them off of skyscrapers, into 100ft deep ponds and surviving lightning strikes with them (well, maybe not..) The knock-off brands – not so much. Warranty. Good, name-brand multimeters will carry a warranty which will get you a replacement if something isn’t working right. Good luck getting the knock-off brand’s manufacturer on the phone. Realistically, for the purposes of a hobbyist, the only one of these that really matters is the Warranty. When you consider you will be spending 5-10x as much for a name-brand multimeter, though – it probably isn’t worth it. A clamp-meter is a multimeter with a big set of claws protruding from the top. 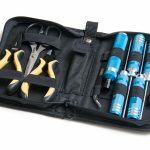 These claws can be used to measure current flow in wires without having to disconnect the wires from anything. 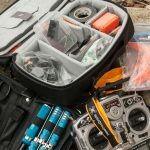 In our opinion, this is the best way of measuring current in a live system – although the benefits of being able to measure current for a quadcopter are admittedly pretty sparse (see below). Nevertheless, since the multimeter is such a universal tool, this may be a feature you are interested in for $20 more. If you do get a clamp meter, pay attention to whether or not is supports DC current and how much current it can detect. 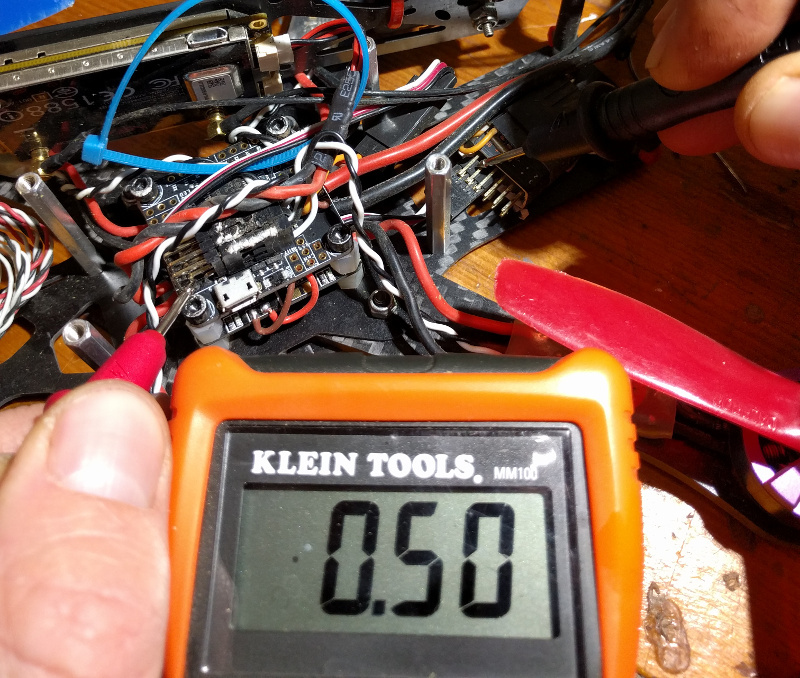 If you want to measure the 100A your quadcopter pulls with a 40A clampmeter, you won’t get very far. Pictured to the right is the el-cheapo Craftsman 34-82141 multimeter, which you can pick up for $10-$20. The interface of this multimeter is very similar to most other multimeters on the market, so we will use it as a reference to go over how these tools work. OFF: Must be selected to turn the device off. VDC: Measures DC voltage. The “20 VDC” mode should be used for measuring voltage in a quadcopter. Ohms: Measures resistance. The “20k Ohm” mode should be used to measure resistance in a quadcopter. BAT: A specialized voltage measurement mode for checking the charge level of alkaline batteries. ADC: Measures DC current. This mode should used when measuring current in a quadcopter. You must use the special white “10A” probe socket when using this mode in lieu of the red socket. AAC: Measures AC current. The modes in this section can be used to measure the current consumed by household appliances that plug into the wall. VAC: Measures AC voltage. The modes in this section can be used to measure the voltage of the wall sockets in your house. You’ll notice most of the sections have numbers in them. 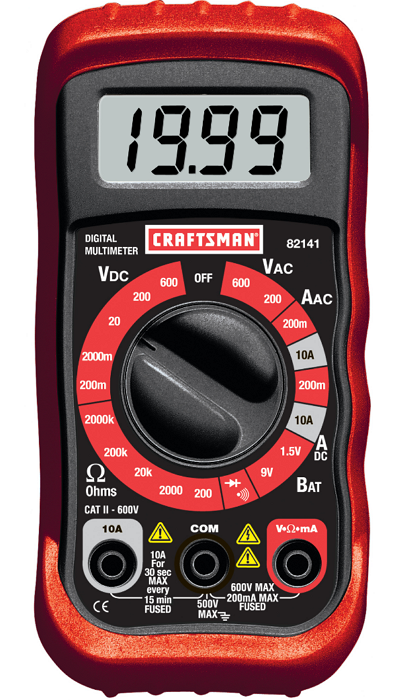 What the numbers indicate is the maximum amount of Volts, Amps or Ohms that will be measured when that mode is selected. Generally, selecting a smaller number will move the decimal point on the LCD display left or right, giving you the ability to see more fine data or bigger numbers – depending on what you are looking for. When the number has a letter on it, such as “200m” for Voltage or “20k” for Ohms – that indicates that the numbers being displayed on the LCD will have a constant value multiplied onto them. In the case of “200m”, the numbers displayed on the LCD will be “milli-volts”, or units of 1/1000th of a Volt. Similarly with “20k” Ohms, the numbers displayed will be “kilo-Ohms”, or units of 1000 Ohms. Your multimeter should come with a pair of probes: one red and one black. These probes should generally be inserted into their respective color coded sockets: black to black and red to red. The exception is if you are measuring AC/DC 10A current, in which case you should insert the red probe into the white “10A” socket. Measuring the voltage you are supplying to your electronics is the first step in any diagnostic effort. Voltage should always be measured across two separated parts of a circuit board. Generally, these two components are your voltage source coming out of a red wire, termed “Vcc” and a ground source coming out of a black wire. 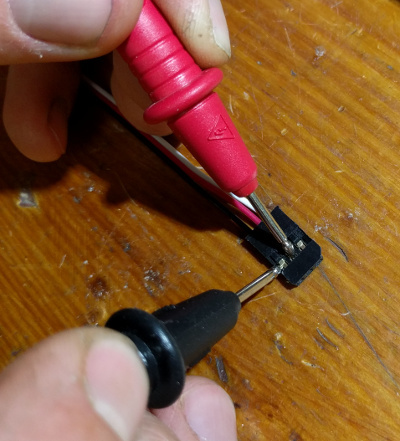 To measure the voltage across two parts, simply put your multimeter into “VDC 20” mode, touch your black probe to a ground source and your red probe to the point you want to test. The LCD on the voltmeter will read out how many volts are detected. Probing the power leads on a servo connector. Our quadcopters use a few different voltages throughout the different components. The ESCs generally expect battery voltage, which rests at 16.8V for 4S batteries and 12.6V for 3S batteries. The flight controller and receiver generally runs on 5V. Many video transmitters and FPV cameras run on 12V. Spektrum satellite receivers run on 3.3V. Don’t take these numbers for gospel – look at the data sheets for the individual components on your quadcopter and find the expected input voltage. Whenever I do a scratch build, I like to double check that the voltage going into each component is what is expected before plugging anything in. Likewise, if you have a component that is not working, the first thing you should do is check that it has voltage. If you probe the Vcc and ground on the component and get nothing – you know that it is likely still working, it just doesn’t have any power. From here, you should start looking at the wiring (see resistance measurement for more tips on this front). A polarity problem is when you connected ground to Vcc and Vcc to ground on a board. Generally, doing this will cause a board to emit the “magic smoke” and completely fail. Sometimes the board will quietly fail, though – leaving you to wonder why your quadcopter no longer has a functioning RX, for example. 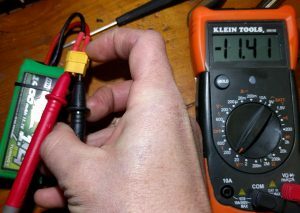 Checking the polarity of your connections is easy using the voltage measurement feature of your multimeter. Simply probe the voltage of the component in question. If the readout on the display is negative, then your ground and Vcc are plugged into the incorrect locations. A left-aligned 1 generally means an open circuit. Measuring the resistance of a circuit or wire in your quadcopter is useful for several reasons. 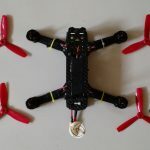 While in most cases you don’t really care about the actual resistance value of the components in your miniquad, this function is very useful for a secondary purpose – finding short circuits or broken connections. Resistance will generally be measured across two ends of a wire or circuit. The idea is to test whether or not these two ends are connected. Notice that when the multimeter is put into “20k Ohm” mode, the screen reads a left-aligned “1” or “Inf”. This is an indicator for an open circuit – infinite resistance. Now try touching the probes together. The LCD should now read out a resistance of 0 – the circuit is being completed through the probes with no resistance. Very low numbers are generally seen when a circuit is short circuited or closed with copper wiring. Probing the Vcc line from the flight controller to the RC RX. Any low resistance value indicates a closed circuit. As mentioned earlier, resistance measurement is best used for checking for short circuits or for finding where a connection is broken. Whenever I’m finished modifying an electrical component or building a quadcopter, I like to do a rough check for short circuits. I do this in two stages, in case I miss something on each step. The first thing I do is test the resistance between the two main power leads going into the component. The resistance should be a very high, non-zero number or a low number that steadily increases. The steady increasing is common in quadcopters – it comes from the capacitors in the quadcopter being charged up by your multimeter’s resistance probing circuit. As long as the values increase – you are good to go. The second thing I do is I use a “smoke stopper“. This is a simple current-limiting device that goes between the battery and the quadcopter and prevents the quad from frying itself from wiring problems. 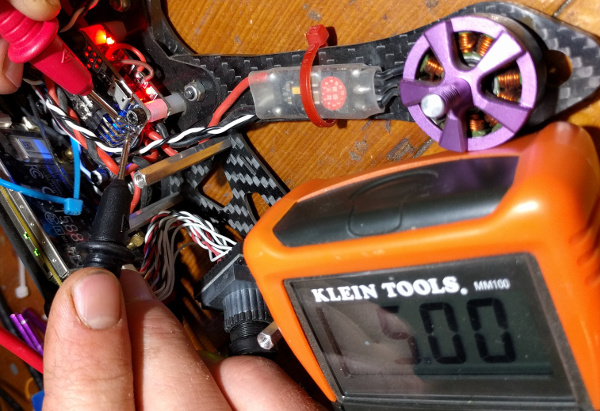 Nothing is more annoying than finding out something isn’t working on your quadcopter after a crash – it means it’s time to put on the diagnostics hat and figure out what broke. Many times, what broke will be a wire or a connector and your multimeter will become your best friend. Use your multimeter to verify your RX is seeing voltage across the Vcc and Ground pins. (Let’s assume it is not). We’ve isolated the problem pretty well at this point, but we should confirm – check the continuity between any ground on the FC and the ground pin that the RX wire plugs into. Chances are you’ll get an infinite reading and you have found your problem – something is wrong with that solder joint on the FC. You’ll need to find a new source of ground for your RX. A similar procedure to the one above can be performed for pretty much any broken component. One of your motors not working? Check the continuity between each of the motor leads and the ESC, then the continuity between the ESC signal wires and the FC. Getting no video? Check the continuity between the Camera and the VTX and make sure they are both powered up. 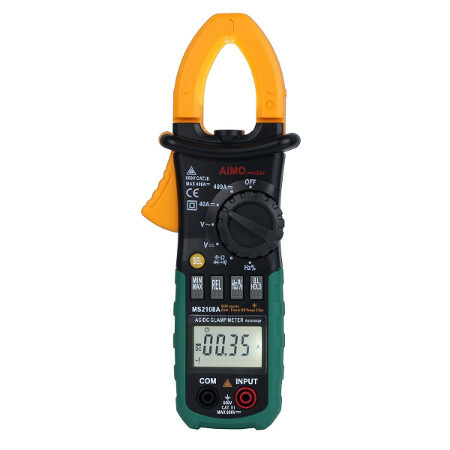 The MS2108A Clamp meter, which can be used to measure current without breaking any connections. The current measurement capabilities of most multimeters is unfortunately of little use to quadcopter builders. The reason is that all but the most expensive meters have limitations of 2-20A of total current measurement. The other problem is that in order to use this feature, you have to figure out a way to put your multimeter in between either the Vcc or the ground of a component and where it is connected. This often means desoldering the wiring for that component – defeating the whole point of using the multimeter as a non-invasive diagnostic tool. If you really want to be able to measure current, we suggest looking into a DC-capable clamp meter. These are specialized multimeters with giant “jaws” sticking out the top. If you hold a wire carrying current in between the clamps, it will read the current flowing through that wire (with some inaccuracy). These can be more expensive that traditional multimeters but I must admit the ability to measure current so easily can be enticing. Just make sure the one you buy supports DC current and not just AC current – many do not. 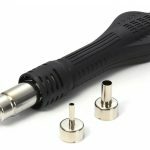 The MS2108A found on Amazon seems to be a good option for up to 40A at $39.99.